I have built what I consider to be a unique page about the Brontës at http://mypoeticside.com/poets/charlotte-bronte-poems, http://mypoeticside.com/poets/emily-bronte-poems and http://mypoeticside.com/poets/anne-bronte-poems where I added several of their poems, their biography, a multimedia gallery and more importantly a timeline and time-map of their life, which can't be found anywhere else online. 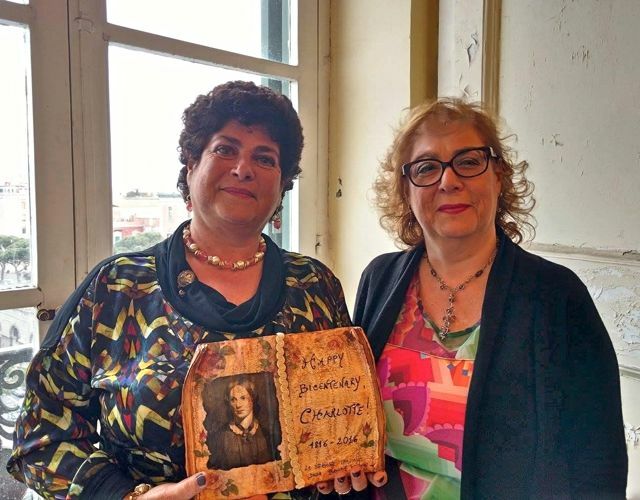 On Thursday 21 April Italy celebrated Charlotte Brontë’s bicentenary in a number of ways and the Italian Section of the Brontë Society was of course involved through its representative, Prof. Maddalena De Leo. She was asked to take part to two radio broadcasts, the first on Rai Radio2 (Ovunque6) and the second on Rai Radio3 (Fahrenheit) where she talked of Charlotte, her importance today and the ‘feminism’ throughout her work. The day in Italy was also celebrated in the Sicilian town of Bronte, where a meeting was held with journalists, teachers and students who spoke of Charlotte and read some of her prose. The Italian representative was invited there as well, and appeared on a Skype conference to greet all Sicilian citizens and to read a message expressly sent from the Brontë Society to the Mayor of the town of Bronte. It was a wonderful occasion to create a promising bridge between England and Italy. In the afternoon a major conference organized by the Italian Ministero dei Beni Culturali was held in Naples at the National Library with Maddalena De Leo and Caterina Lerro as speakers in front of a large and involved public. Prof. De Leo read her interesting paper about Charlotte’s heroines in Juvenilia and in the novels mainly pointing to the differences existing between the first and the second group of them, Prof. Lerro spoke of the meaning of Jane Eyre as a novel, commenting on three of its most important pages (the incipit – the meeting with Rochester – ‘Reader, I married him’) with the help of her students who played the parts of the characters. A tour of the current exhibition - Charlotte Great and Small - with a series of commentaries from its curator, Tracy Chevalier, was one of the highlights of yesterday's bicentenary celebrations at the Parsonage. An item in a glass case in the Bonnell Room, where the tour started, is one of the letters which an agonised and infatuated Charlotte sent to Monsieur Heger at the Pensionnat in Brussels, which was first torn up by the recipient, then sewn back together by Madame Heger. Interestingly, we were told that studies of the folds in the paper show that M.Heger kept it intact for years. One speculation is that Mme. Heger wanted to preserve it as evidence that her husband had not actually 'done anything' with his pupil. Four works by the artist Ligia Booton take off from this letter, and hang on a wall nearby, part of the exhibition. 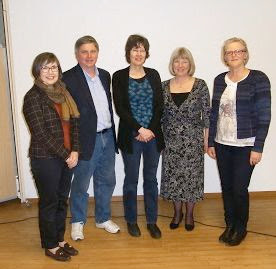 Committee members of the Brussels Brontë Group with Juliet Barker. Juliet Barker and Lisbeth Ekelof. Juliet Barker’s eagerly-awaited talk in Brussels, over our weekend of events to celebrate the Charlotte Brontë bicentenary, took place against the backdrop of travel disruption following the attacks of 22 March. With flights cancelled or deviated, the weeks leading up to 16 April were anxious ones and the news of a Belgian air traffic controllers’ strike shortly before she was due to fly seemed the last straw. But she made it to beleaguered Brussels Airport, all the way from her home in North Yorkshire. 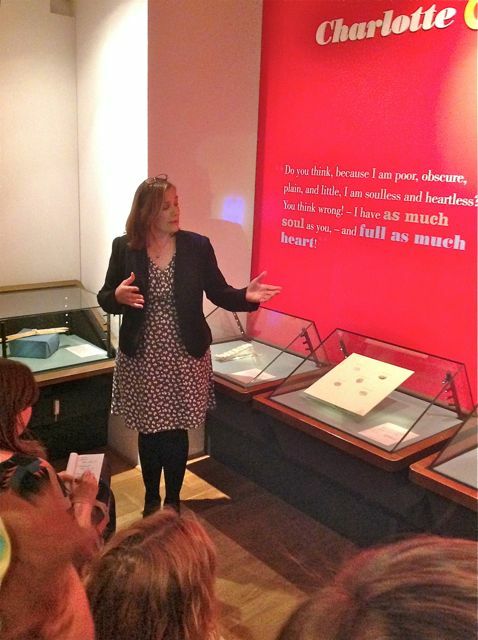 The main focus of her talk was The things Gaskell left out of her Life of Charlotte Brontë. Over dinner the evening before the talk, Juliet expressed admiration for Mrs Gaskell as a novelist, but her talk made it clear that she has a few bones to pick with Gaskell the biographer. In Barker’s view, the problem with Gaskell’s Life is that it is a fiction rather than a truthful biography. She began with a reference to an article published in Sharpe’s London Magazine in June 1855, shortly after Charlotte’s death, that deeply upset her friend Ellen Nussey. Called ‘A few words about Jane Eyre’, it revived many of the rumours about Currer Bell that circulated when that novel was published. It contained not just accusations of Charlotte’s impropriety and ‘coarseness’ but accusations against her father, claiming that he had neglected his children and left their education to servants. Nussey was so incensed by the article she asked Mrs Gaskell to mount a defence of Charlotte. Yet ironically, as Barker pointed out, the original source for much of the information in the article was Gaskell herself. It was taken from letters written by her the Lake District shortly after her first meeting with Charlotte, based on spiteful gossip by a disgruntled former employee of the Brontës. When she embarked on her biography, Mrs Gaskell herself admitted how hard it was for a novelist to be strictly truthful (‘You have to be accurate and keep to facts; a most difficult thing for a writer of fiction’). Barker’s claim is that Mrs Gaskell in fact had no intention of being objective and impartial. Her objective was to defend and vindicate Charlotte as a woman and writer and, in the process, facts were distorted or suppressed; what she omitted was as important as what she included. Barker started with Gaskell’s description of Haworth, using contemporary sources to demonstrate how far removed the real village and its inhabitants were from the remote spot and wild, lawless community depicted by Gaskell on the basis of sources 100 years out of date. Not only is Haworth a mere four miles from Keighley, but when the Brontës lived there it was a hive of industrial and cultural activity. Far from being a cultural desert, it had an abundance of concerts as well as textile mills, and the Brontës were involved in village life. Barker then referred to the Brontë juvenilia, pointing out that the sense of fun and the relish for violence and debauchery that overflow from its pages are at odds with the picture of the young Brontës’ oppressed and deprived childhood painted in Gaskell’s Life. Turning to Charlotte herself, Barker claimed that in portraying her as a martyr whose sense of duty predominated, Gaskell suppressed many facets of her character. Among these were her hatred of teaching and of her pupils and her rebellion against the restrictions of her life, as revealed in the journal she kept at the Roe Head school. Barker devoted a large section of her talk to Charlotte’s time in Brussels, since one of Gaskell’s most important omissions was Charlotte’s feelings for Constantin Heger. Revealing her love for a married man would have given credence to the notion of her moral laxity both as a writer and – some reviewers suggested – a woman. Gaskell’s use of Charlotte’s letters from Brussels and, later, to Heger exemplified her cavalier attitude to documentary sources. Gaskell quoted from these letters very selectively, omitting Charlotte’s account of her confession in the Cathedral and her more emotional appeals to Heger. She gave the impression that Monsieur and Madame Heger acted in unison with regard to Charlotte, claiming that it was Madame’s idea to send one of the Heger children to be educated by the Brontës in Haworth even though Charlotte recorded that the idea came from Monsieur but was vetoed by his wife. She distorted the facts to account for the estrangement between Charlotte and Zoë Heger, attributing it to differences over religion even though Heger was just as devout as his wife. Charlotte’s growing unhappiness in Brussels is attributed by Gaskell to her concerns about Branwell, though these belonged to a later date after Branwell was dismissed from his post with the Robinsons. Gaskell succeeded in her aim of establishing Charlotte’s reputation as a woman and gained a reputation herself as a great biographer. But despite Patrick Brontë’s tribute to theLife as ‘in every way worthy of what one great woman should have written of another’, the storm of protests from Mrs Robinson and others who believed themselves maligned in the book left Gaskell feeling ‘battered and bruised’, Barker said, determined never to write another biography and to confine herself in future to the safer realm of fiction. 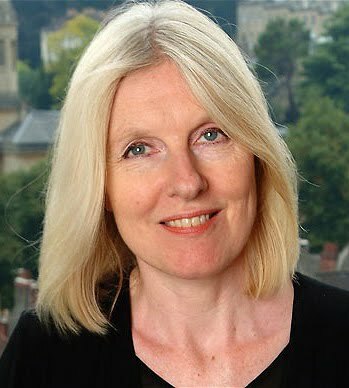 Juliet Barker’s talk was followed by a rewarding and wide-ranging question and answer session in which she took the opportunity to defend Patrick and Branwell Brontë, with both of whom she believes Gaskell dealt unfairly. Patrick was an inspiring teacher of his children and Barker pointed out the similarity between his methods and Heger. He would get the children to read articles and then talk and write about them. Instead of rote learning they were encouraged to think for themselves and become passionately involved in what they learned. Barker also views Branwell as an inspirational force, claiming he was always ahead of his sisters creatively. He was innovative and the first to get published (he had a poem published in a local paper). It was his idea to write novels rather than poems to make it easier to find publishers. In Barker’s view his achievement was less than his sisters’ not just because he lacked their application but because of the sheer diversity of his talents. Barker also defended Arthur Nicholls, charging Gaskell with revealing too much about Charlotte’s initial rejection of him and being influenced against him by Ellen Nussey. Barker’s verdict is that in her concern to protect Charlotte’s reputation, Gaskell did not scruple to damage that of the three men closest to her. 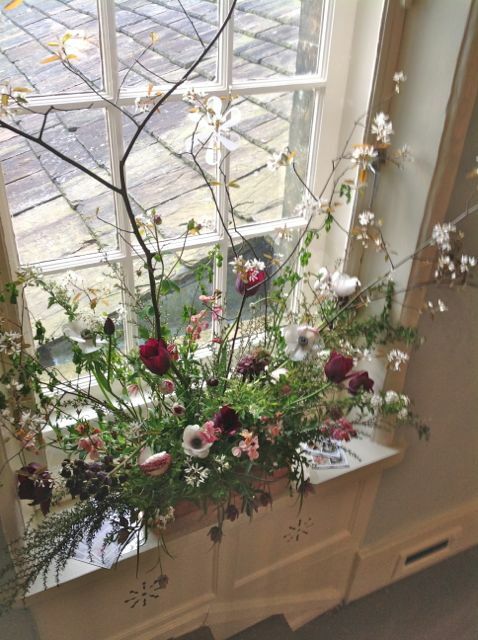 Charlotte's Birthday Party takes place in Haworth - in the Old School Room - all day this coming Thursday 21 April, finishing at around 8pm. At 2.45pm you'll be able to see (and taste?) 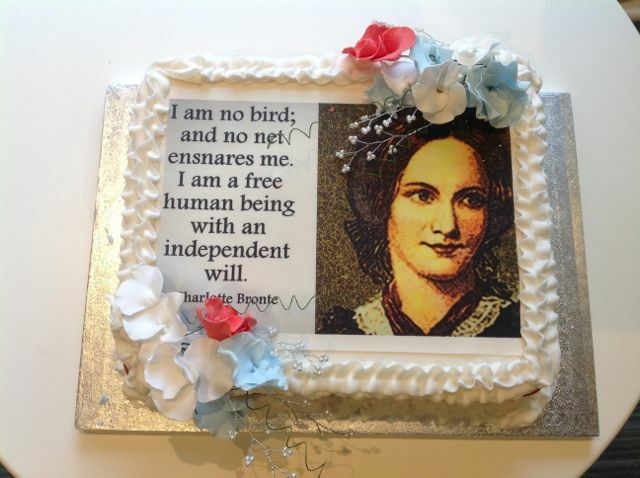 the cake made for the occasion by Great British Bake Off contestant Sandy Docherty. Find the full details on the Parsonage website - see Links. If you are within reach of Dewsbury Library in the morning, you might be interested in a talk I am giving, illustrated by Powerpoint slides, which begins at 10.30am. I will be reading extracts from Charlotte's letters and from Jane Eyre, and I will also be in role as John Benson Sidgwick, the partner in a mill business who owned Stonegappe, where she was an unhappy governess for a short while. He will see the situation from his point of view. The three locations are Roe Head School in Mirfield, Stonegappe and Wycoller Hall, the inspiration for Ferndean. You don't need to book, just turn up. 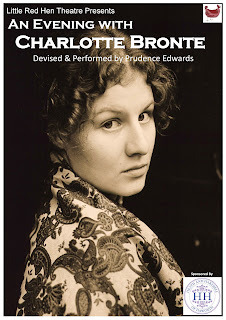 Devised & Performed by Prudence Edwards, this one-woman show brings to life extracts from the works of Charlotte Bronte; her poetry and fiction, including her masterpiece, Jane Eyre; and gives the audience a glimpse into the mind of a genius. Something of a 'Tour de Force'- a personal and well chosen insight into the world of Charlotte Bronte. Beautifully presented. Intelligent, insightful and poignant, it was emotionally engaging, I loved the staging. The story-telling way was so amazing. I was wandering in a fantastic dream. I should imagine, judging by the favourable response to an entertaining evening held in the old school room in Haworth, many copies of Jane Eyre will be purchased from booksellers and dusty books, with that title, will be retrieved from the dark recesses of libraries and book cases in the very near future. 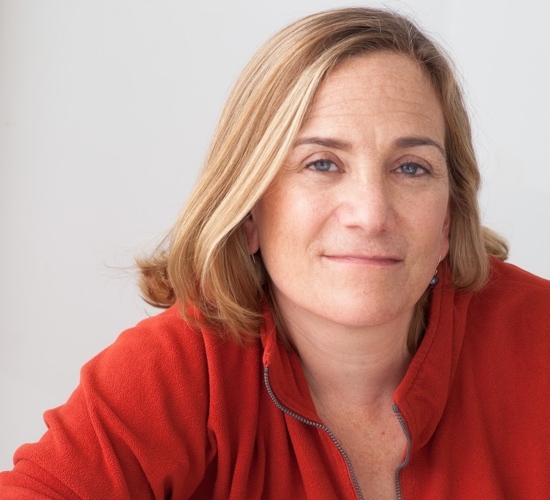 Tracy Chevalier (pictured), whose second novel was Girl with a Pearl Earring, and who has curated the exhibition Charlotte Great and Small, exhibiting at the Parsonage Museum this year, explained how a book, which was being launched that very evening, came about. 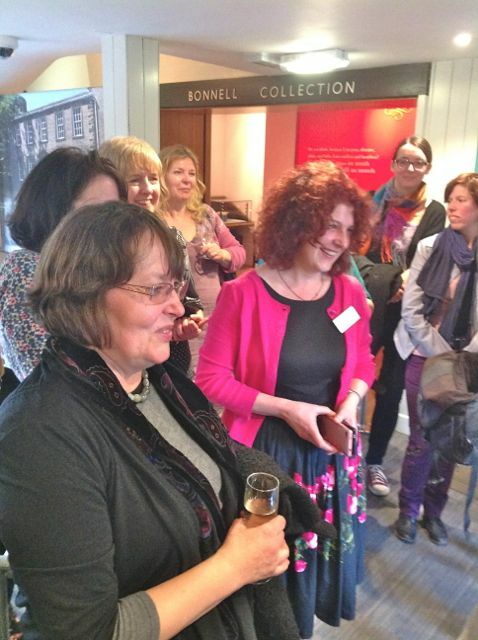 Working closely with the museum she had wanted to produce something special to commemorate the bicentennial of Charlotte Brontë’s birth and so she decided to ask writers from all over the world to contribute to a book which would be based on something ‘Charlotte’. At first it was envisaged that an object associated or belonging to the author would be the theme but in the end the well -known words from near the end of Charlotte’s Jane Eyre seemed the ideal choice. Before the large audience made their way to the Parsonage for refreshment, the place where Patrick Brontë learnt with some apprehension that his eldest daughter had written a novel, they heard two writers reading their own stories from the new book. The door nearest me opened, and a servant came out, a woman of between thirty and forty; a set, square-made figure, red-haired, and with a hard, plain face: any apparition less romantic or ghostly could scarcely be conceived. ‘Too much noise, Grace,’ said Mrs Fairfax. ‘Remember directions!’- Jane Eyre Chapter 11. 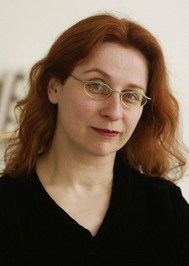 Audrey Niffenegger (pictured), an American writer, artist and academic whose debut novel was The Time Traveler's Wife, read her story which is set during World War 2 and which tells how the orphan Jane arrives from London in a jeep at a Northern orphanage. At this austere place where her hair is cut off, where rats roam in dormitories and breakfast consists of burnt porridge. Jane meets Helen who becomes her friend. Helen, a very intelligent girl, is treated most unfairly by the teachers and after telling Jane how she had been sent away to a pharmaceutical company, supposedly to take part in experiments to find a cure for the common cold, becomes very ill. Soon afterwards Jane is devastated to be told that her friend has died. Spending the rest of her childhood at the orphanage Jane is lucky that, unlike many others of her fellow residents at the orphanage who sink into a life of prostitution, drug and alcohol addiction, she finds a post looking after a child at a large country house. When the girl, Adele, outgrows her care, Jane returns to her native London and, whilst paying a trip down memory lane to the bombed out area of her earlier years, is astounded to bump into her old friend Helen- but a Helen whose features are now ravaged by smallpox- the smallpox with which she had been infected at the laboratory when she was a child. Apparently the antidote given to her then, did not work and it was because of fear of contagion that the teachers had treated Helen so badly. However the modern day Jane would have a chance to sleep with her arms around Helen’s neck again for there was to be a happy ending for the pair as they were reunited and then set up home together. Much later, as the law changed, they could say with complete honesty: "Reader, we did marry." The couple spent their honeymoon in Ireland, with her new husband showing her around Dublin, including Trinity College, where he had been a student. They then travelled to Banagher, Co Offaly, to meet members of his family, continuing on to Kilkee, Tralee and Killarney. Charlotte admitted she was enthralled when she saw the majesty of the Atlantic Ocean for the first time, but some old prejudices remained. "I heard a great deal about Irish negligence,'' she wrote in one of her letters back home.